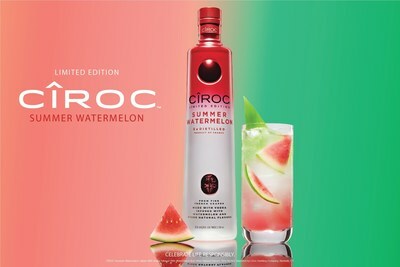 NEW YORK, April 15, 2019 /PRNewswire-HISPANIC PR WIRE/ -- Sean "Diddy" Combs, DJ Khaled and the Makers of CÎROC Ultra-Premium Vodka proudly unveil CÎROC Limited Edition Summer Watermelon, the newest addition to the successful flavor portfolio. CÎROC Summer Watermelon is a rich tasting spirit made with vodka five times distilled from fine French grapes, finished in a tailor-made copper pot still in Southern France. The vodka is masterfully infused with a distinctive blend of Watermelon and other natural flavors, resulting in a delectably juicy fresh taste accented by a sweetness and zest that carries into a smooth finish. The liquid is packaged in a luxurious and sultry red and white bottle with sleek matte red lettering, commemorating a fiery hot summer celebration. CÎROC Summer Watermelon can be enjoyed on the rocks or mixed with club soda or a variety of fresh ingredients such as pineapple juice, cranberry juice, lemonade and lime. Following on the heels of past summer offerings, CÎROC Summer Watermelon is available for a limited time only. 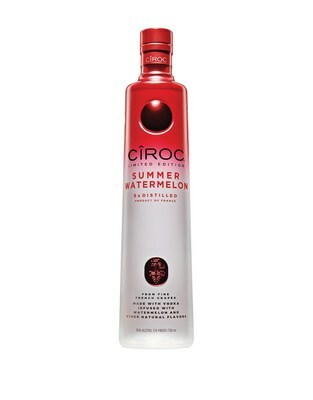 "I am excited to introduce CÎROC Summer Watermelon as our newest flavor innovation, right in time for the summer," said Sean "Diddy" Combs. "We wanted to bring something fun, and refreshing tasting to the table this season. With this spirit we aimed to capture the essence of summer and bottled it. CÎROC has a reputation for delivering the most successful flavor innovations and we aim to do this again with Summer Watermelon." To create the summer blend, Sean "Diddy" Combs tapped long-time friend and award-winning producer DJ Khaled. The pair worked in partnership with Diageo to identify the proper flavor profile, liquid and taste appeal. The result is CÎROC Summer Watermelon - a product that is born from summer and bred for sunshine and only available for a limited time. "I love working with Puff because I know that he puts 100% into everything that he does. He always hustles to make sure that it's the best product," said DJ Khaled. "We have the same work ethic and values, so working together to create this limited-edition special flavor to help kick off the summer was key! Working hard also means celebrating your success, and CÎROC Summer Watermelon was designed specifically for celebration. The summer season is all about being around those you love and celebrating your wins!" Combs and DJ Khaled introduced the world to CÎROC Summer Watermelon via a dedicated guerilla style social media blitz inclusive of a :30 teaser campaign and launch announcement earlier this month. On April 12th, the makers of CÎROC brought CÎROC Summer Watermelon to Coachella Valley, home of one of the world's largest music festivals. To kick off the festivities CÎROC partnered with LA Weekly and turned the nostalgic Palm Springs Korakia Pensione into the CÎROC Summer House, a one weekend only takeover, offering hotel guests and visitors their first taste of summer. In addition to a bevy of unique interactive experiences and a larger than life watermelon patch, Ashlee Simpson-Ross and Evan Ross joined the brand poolside for the Official CÎROC Summer House Kick-Off Event. Throughout the weekend festival goers enjoyed summer in a bottle at select day parties, brunches and influencer gatherings including the iconic Republic Records, Rolling Stone Live and a special performance by Saweetie at Moschino x Jeremy Scott event presented by CÎROC. CÎROC Ultra-Premium is made from Fine French grapes, which are distilled five times, providing a crisp, clean taste and citrus nose. CÎROC Ultra-Premium launched nationwide in January 2003. In October 2007, DIAGEO ? the world's largest spirits and beer company ? made spirits history by entering into a strategic alliance with entertainment entrepreneur Sean "Diddy" Combs, in which Mr. Combs and Combs Enterprises assumed the lead on all brand management activities for CÎROC. The infused Vodka flavors in the portfolio to date include CÎROC RED BERRY, CÎROC COCONUT, CÎROC PEACH, CÎROC PINEAPPLE, CÎROC APPLE, and CÎROC MANGO, and CÎROC TEN Vodka. The brand received a 2013 Beverage Industry News Award of Excellence, was named 2011 Spirits Brand of the Year by Market Watch and earned a double gold medal from the San Francisco World Spirits Competition in 2010.